PowerSolo are a wild and crazy Danish nouveau-punk duo. They mostly tour around Europe, not the UK. My old friend Pinball Geoff put me onto them recently – they are even more mad than his band, the Bikini Beach Band. Short story. 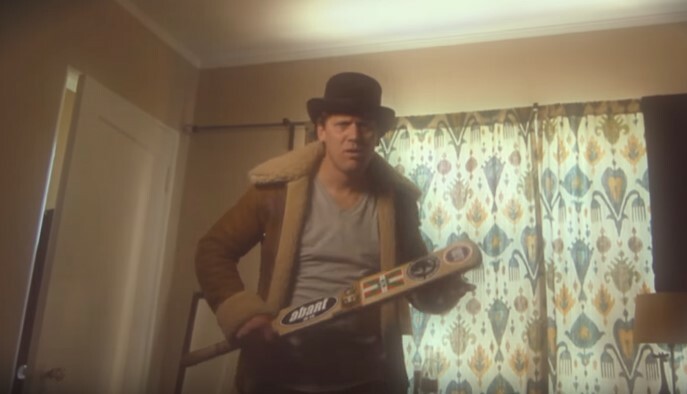 During the first twenty seconds of the video for Powersolo’s song, Frantic, one of the Danish duo is gratuitously roused from his slumbers with the use of a cricket bat. To add to the confusion, Clint Eastwood sort-of introduces the video. It’s all a bit cog-dis, especially the cricket bat bit. First four day Tests, then this. Excellent comment by Ged on the four-day Test malarkey a couple of posts back. I particularly enjoyed this complimentary remark by Bail-out on the quality of Ged’s comment on the four-day Test malarkey. Top appealing, guys. In other news, TRJ’s back! As in, he has a stress facture in his L5 vertebra, he’s not going to return to the Middlesex side at Taunton on Monday to try and secure his county’s mathematical safety and send Somerset into Division 2 or anything. Thanks for introducing me to PowerSolo, potty as parrots but terrific stuff. I don’t think it will make you revise your assessment of PowerSolo’s pottiness-level. Yes, agreed. I forwarded your KC youtube video to Dom who has worked for me last couple of years. He has sloped off to Uni now. He described it as a Banging Tune so so you are obviously down with the youth, Ged. Is “potty as parrots” another saying? I can never work out whether you have an extraordinary talent for words and turns of phrase, or you are exposing us all to regional/historical expressions of which I was previously oblivious. Commonplace? Or perhaps that’s why I’m Edwardian. Aargh, how did I miss this? Japan women beat South Korea women by 9 runs in the East Asia Cup. Sadly no sixes in the South Korea match – I’d love to hear a commentator screech “maximum…Park hits the ball out of the park”. Now there’s self-awareness/control. Good man, Jimmy.